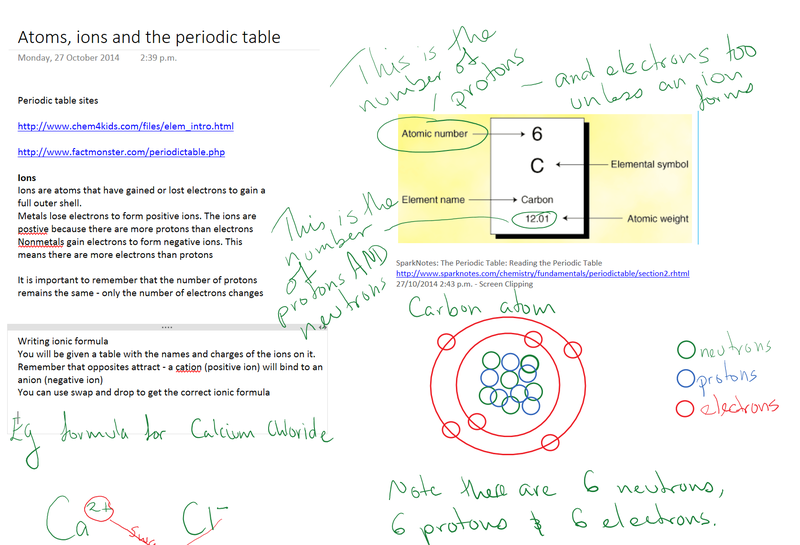 Microsoft Onenote has become my favourite tool in my digital teaching and learning tool box. I was a little slow on the uptake, but attending ulearn14 and MIEE really opened my eyes to the potential of Onenote. The biggest plus for me is Onenote is just so versatile, easy to add into and visually appealing. Using it on the surface pro is just a dream really. I really like the inking feature, writing over text is simple and easy – even down to changing colours. This inking feature really helps with some science concepts – we use a lot of symbols and diagrams that are so much easier to add in by hand. I have been using it today to prepare some revision material for my junior students (14-15 year olds) who have their exams in 2 weeks. I have made a section for each topic and then pages within each topic for more specific detail. I am using a mixture of text and ink. A great feature is when you take a screen shot, the link is automatically included. This means the source is acknowledged and students can go to the source for more information if they want to. It is my goal to go over this with my class tomorrow. As I do it, I will add in any additional questions they have. Then I will save it to the ultranet page so they can access it from home. I am hoping that next time I can leave the initial pages a little more blank so I can fill in the gaps as I go so the students can see the thinking – at this stage I am still a bit messy with my writing on the fly 🙂 I don’t have a mirror cast/wireless projection system in my room yet, but I do have the adapter to show this on the projector. I was not sure about using Onenote or Office mix for this task, but settle on onenote as I can add everything to the same place. Next lesson I might do as an office mix and then embed it into onenote (I’m not even sure if this is possible – hope so). So there is my attempt to liven up some fairly dry exam revision. I’m planning for a brief blurb from me and the students will be able to explore the links and attached documents at their own pace in and out of class (I have one set of laptops booked so it will be one between two during class time). Hopefully the students like it and find it helpful – if not it will be back to the drawing board.